This story shows how hearing loss and damage to hearing does not discriminate! 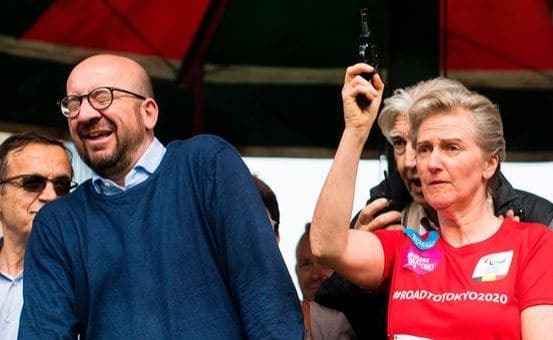 This photo shows the moment that Princess Astrid of Belgium, younger sister to the current Belgian Monarch King Philippe, damaged PM Charles Michel's hearing by firing a starting pistol right next to him. As you can see, his face shows just how uncomfortable loud, sudden noises can be. Though the event was initially laughed off, the Belgian PM later sought medical examination due to the development of tinnitus (ringing in the ears) following the event. Tinnitus is usually temporary following a loud event, such as a music concert but Mr Michel's seems to be persisting as he has cleared his entire schedule for this week. His treatment will continue throughout the week. While it may have been initially laughed off to avoid any embarrassment, such incidents of noise exposure can result in significant permanent hearing loss and tinnitus. The OSHA and NIOSH permissible exposure limit for impulsive noise (such as a gun blast) is 140 dB SPL. Without hearing protection, sound exposures exceeding 140 dB can result in lasting damage. Therefore, even a single exposure to a loud gun blast without hearing protecting can result in permanent hearing loss. A recent examination of impulse noise by Sondergaard, et al, found that at .5 meters (about 1.5 ft) from the blast, sound levels from a starter pistol reached as high as 166 dB. Based upon the study, the authors concluded the shooter would be required to wear hearing protection and that nearby athletes and spectators could be potentially be at risk for hearing damage based upon current NIOSH and OSHA sound exposure guidelines. Noise-induced hearing loss is becoming more and more common, so hopefully this can teach us all to be more careful with our hearing. Particularly as this kind of hearing loss is permenant and the high frequency nature of the loss makes hearing speech in noise particularly difficult. Get well soon Mr Belgian Prime Minister!